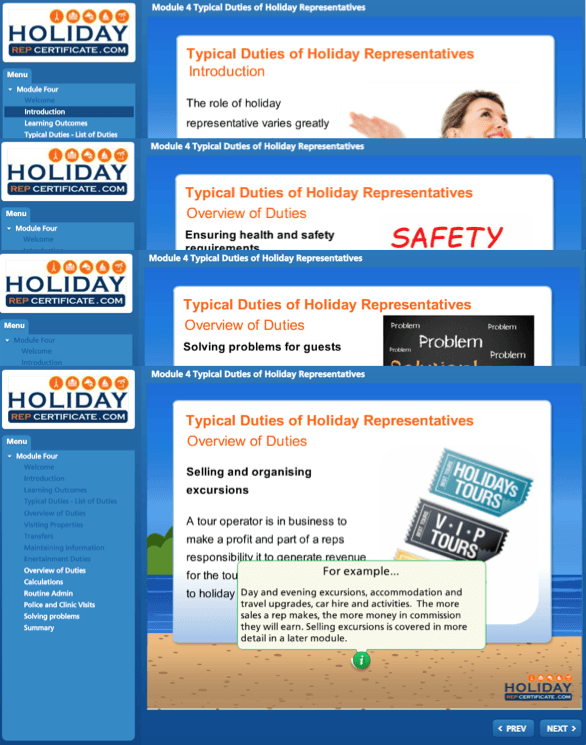 This essential module provides you with a real-life overview of working as a holiday rep and highlights the importance of the role in ensuring a happy and safe experience for holidaymakers. Find out if you are really cut out for life as a holiday rep with our unique drag n drop activities! 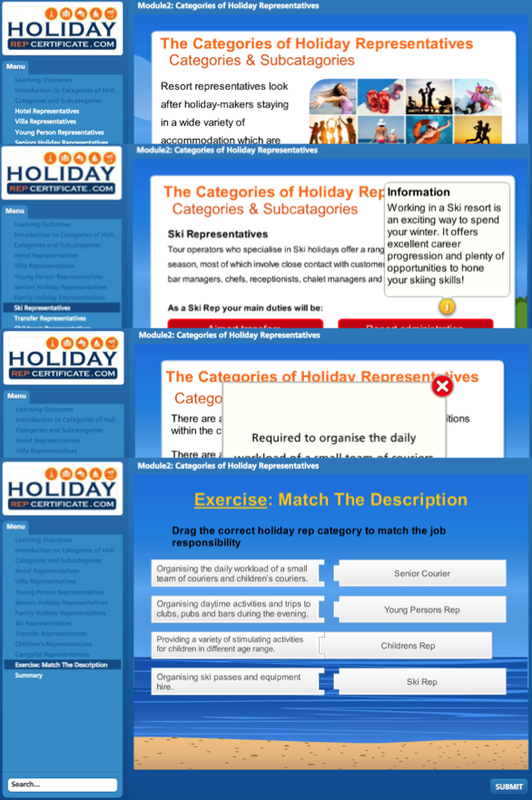 Holiday Reps are typically classified into different categories and sub-categories. In this packed module we will explore each one of these categories and subcategories in turn and examine the key roles and basic responsibilities and requirements of each. Holiday reps need to have the knack for dealing with people and the ability to stay calm under pressure and still keep smiling at the end of a hard day! 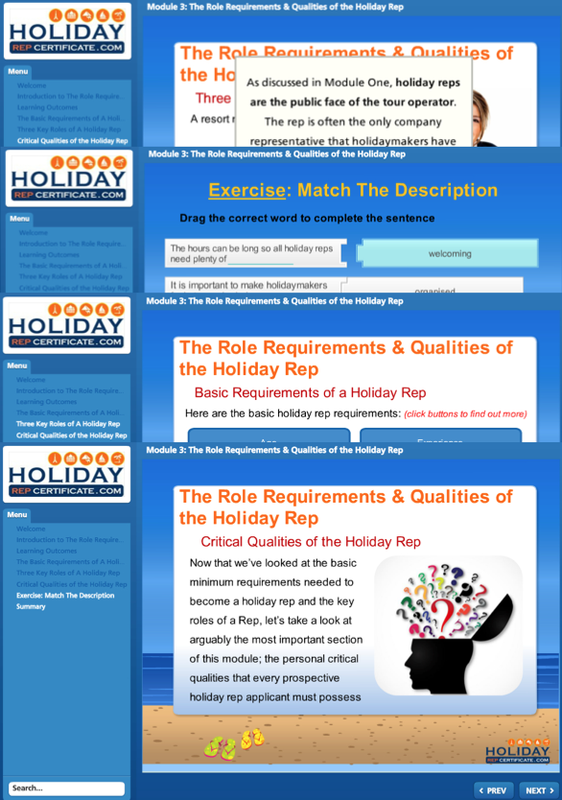 In this interactive module we take a look at the minimum requirements you need to become a holiday rep, the key roles of a Rep, and the personal qualities that every prospective holiday rep applicant must possess. 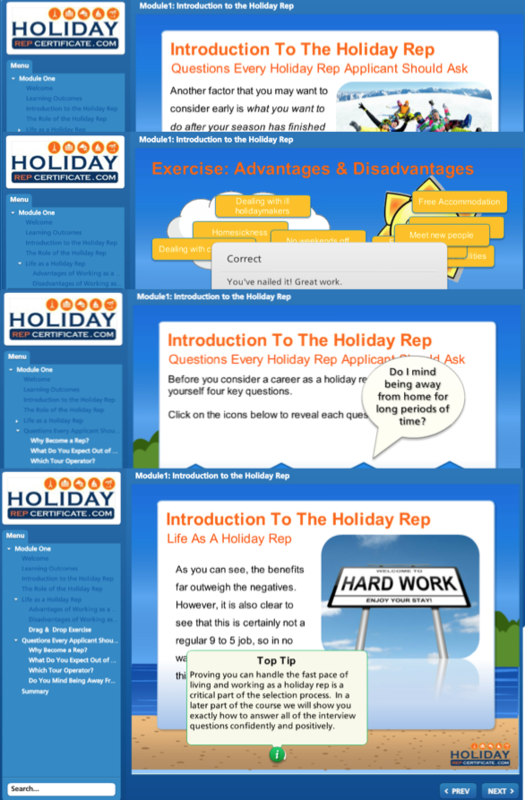 The role of holiday representative varies a lot from day to day. But regardless of which tour operator you work for there are certain job duties that come as standard. The purpose of this module is to give you an in-depth understanding of those typical duties which will also help prepare you for the interview. During any interview with a tour operator it’s always impressive when you can demonstrate knowledge and understanding of the travel industry. This module will help you to recognize the key tour operators and understand which segment of the holiday industry each brand operates in. You’ll impress any interviewer with this level of knowledge! In this interactive module we are going to break down the elements that form the basis of the transfer and welcome meeting. You will also watch a series of short videos demonstrating a real welcome meeting – exactly as you the holiday rep would be required to deliver one. Not to be missed! The job of holiday rep involves plenty of administration and important paperwork. In this module you will learn the reasons behind this paperwork, how to complete it correctly, plus you’ll get to see real-life examples of the most commonly used forms. This may not sound like the most exciting subject to you right now, but by the end of this interactive, step-by-step module you’ll be a MASTER of currency conversion and percentage calculation – and you’ll actually enjoy doing it! This skill probably won’t impress your friends, but it WILL impress any tour operator that you apply to and make you a standout candidate for the job! Holiday reps play a vital role in ensuring that holidaymakers not only have a holiday that is memorable and enjoyable, but also one that is as safe as possible. 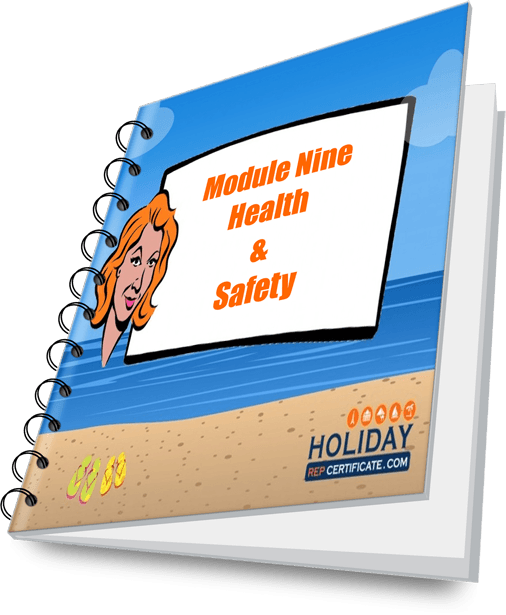 In this module you will learn how to identify potential hazards and risks in the holiday environment and you’ll understand how to minimise those risks to ensure a safe and happy holiday for everyone. People nowadays are far more willing to complain if their holiday does not meet up to their expectations. In this module, we will look at the legal responsibilities of a tour operator and the important role that holiday representatives play in carrying out these legal responsibilities. A major part of the role and responsibility of a resort rep is to be able to offer an excellent level of attention and service to the customers who have paid to enjoy an exceptional holiday experience. This module looks at some of the basics of customer service, what holidaymakers expect and you’ll discover best practises for exceeding these expectations and being the rep that everyone loves! Fortunately most people have a trouble-free holiday but there are occasions when reps have to deal with complaints. How you handle them can have a major impact on both the customer’s holiday experience and the reputation of the tour operator. In this module we will uncover the main reasons why holidaymakers complain and how to deal with these issues efficiently and effectively. Selling is an important part of a rep’s job but it’s a skill that anyone can learn. Sales of products and services in resort generate a lot of additional revenue for tour operators but also provides the rep with extra pocket money! Follow the highly effective sales process outlined in this module and you’ll not only impress at the interview – but you’ll also have other reps scratching their heads trying to figure out why you’re earning more money than they are! In this module we are going to look closely at the vital role that social and communication skills play in the day-to-day job of the holiday rep. You will learn the key elements that make up social and communication skills and you will learn how to apply them effectively to your daily duties to ensure maximum job and customer satisfaction. While the job of holiday representative can appear to involve a lot of time spent working on your own, it is actually very much a team role. In this module, you will learn about the importance of effective interpersonal and teamwork skills and how to apply it to ensure your success as a holiday rep.
By the end of this module you’ll understand the common causes of stress for holiday reps and you’ll discover some quick and easy stress busting techniques to ensure that your time working overseas is a happy and successful experience. The great perk of being a holiday rep is that you get to work in resorts all over the world. For this reason it is important that you have a good understanding of travel geography and an awareness of key resort destinations. In this module you will learn about the location of key short haul destinations and the different segments of the European travel market, such as summer sun, winter sun and winter sports. Tour operators often comment that holiday rep applicants have a poor understanding of world geography. Naturally, this doesn’t do your job prospects in the travel industry any good at all! But before you rush out and buy yourself atlas, in this module you’ll learn all you need to know about long-haul destinations, world time zones and you’ll learn how to quickly convert the time in one country to the time in another.